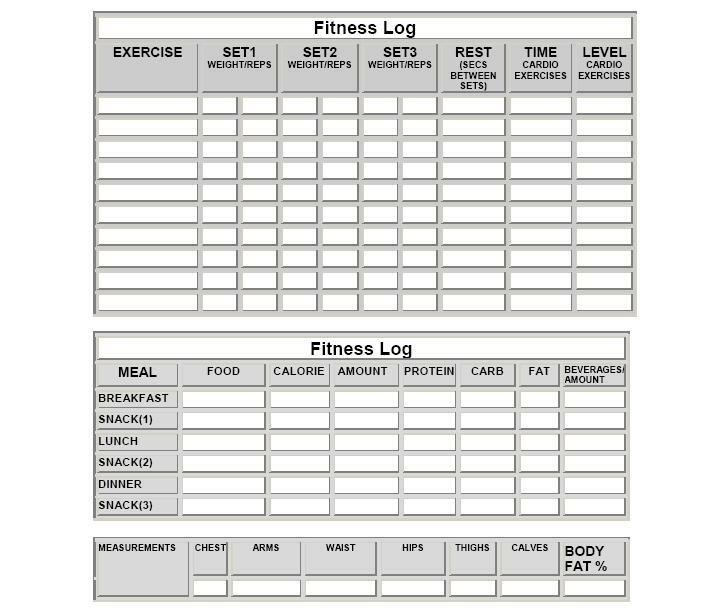 Below if a collection of printable fitness, exercise and diet log sheets to help track your results. Logging your fitness plan is one of the best ways to monitor and stick with your workout program. Just click the links of the type of logs you're looking for. Keeping a daily, weekly or monthly journal of activities helps you to track your progress. Planners also help you to record your short and long-term goals. No matter how often you use your log, writing down your gym, home or work activities is a good idea. This section contains easy planner logs for men, women or kids. Each planner includes a word or pdf. template that you may download and adjust for your use. If you need a fitness log book, check out BODYMINDER Workout and Exercise Journal (A Fitness Diary) This journal is one of the most popular log books on Amazon. What should you write in your fitness activity log? In the left column, write down the specific exercise that you performed. These exercises can be cardio, weightlifting or any type of activity you perform. For example: Write “Treadmill” in the first column, first row and “Barbell Curls with overhand grip” in the second row. This will help you keep up with the specific exercise you completed. You should also record your flexibility exercises. Place the name of the stretch that you perform static or dynamic stretch. Note how many repetitions you performed and the amount of weight you used for each set. For example: If you performed the Bench Press using 135 pounds, 10 times for 3 sets you would put “3”in the sets column, “10” in the reps column and “135 pounds” in the weight column. In this column, you should put the amount of time you rested in seconds or minutes. This should be amount of rest you took between each exercises or set you performed. It is important to be very detailed so take a stop watch to the gym with you. Record how much time you spent doing the cardiovascular exercises. For example: If you did the treadmill for 30 minutes, put 30 minutes in the Time column corresponding to the exercise you performed. For any cardiovascular machine you use put the levels that you used. This will help you track your progress for that specific machine. For example: If you ride the elliptical machine for 30 minutes on level 5, you should record that in the last column corresponding to the row of the exercise. At the bottom of the activity log, you should place your measurements weekly, monthly, or every other week. It is also a good idea to put how you were felling physically and emotionally that day. For example: Did you feel energetic, tired, or sick. Did you have a good day or a bad day outside of your workout? Your workout log gives you a good indication of your physical fitness progress on paper. It is important for you to see your reps go from 10-15 for the same amount of weight. Looking at a prior workout log, you may also notice you can run on the treadmill or step on the stairstepper for a longer time.